Coloring is both a relaxing and creative hobby. No matter the age, everyone can color and most importantly, feel like an artist. This machine embroidery design is made entirely In The Hoop, ITH. It's a fast and fun way to express your unique creative side. 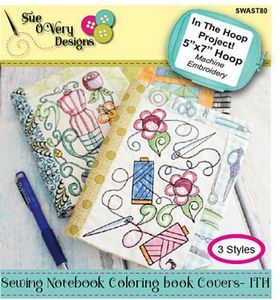 The notebook cover is created with three (3) separate hooping's. The coloring book part is a single color outline stitch. The notebook cover is completely lined with no raw exposed edges. The flaps are included as part of the construction. Comes in one size (designed for a 5in x 7in notebook) with three (3) different designs. Dress form with flowers, Quilting blocks and thread n needles. These bags require an embroidery machine using these size hoop or larger: 5in x 7in. Bag finished open dimensions are: 7in tall x 11-1/4in wide and 7in tall x 5-1/2 flat. Designs stitch with a single color outline allowing you bring them to life by adding your own touch of color using fabric markers. Fat Quarter friendly.